In an hour’s drive north of Zagreb, The Trakoscan castle is a fortress of the thirteenth century, which was part of the Northwest Croatian Defence. 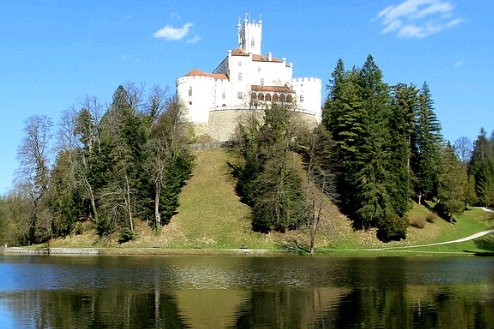 Today, the castle, the park, the lake and the forest that surrounds it, is one of the few buildings in Croatia which preserves the original architectural features. Dropped in ruins after the Second World War, in recent years has been the object of restoration and restoration, which brought to the ancient splendour. Inside a museum with a collection of books, paintings, furniture and weapons. All are very interesting, and romantic. All around scenic hiking trails, woods and an artificial lake that you can navigate by renting paddle-boats; great for taking pictures. Paid parking, many stalls to buy a souvenir, and also a bar and a restaurant. The Museum is open daily in summer from 8 to 18, in winter from 9 to 16. The entrance ticket for adults 30 kuna (about €4 at current exchange rates), 15 kuna (€2) for the kids.